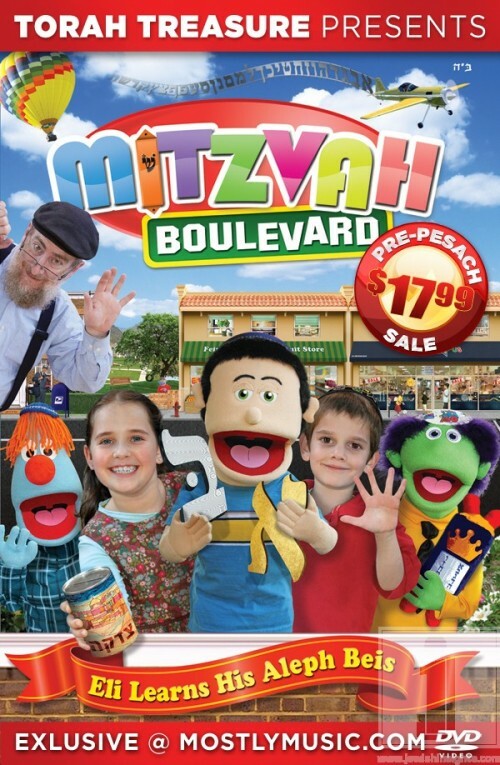 “Mitzvah Boulevard,” the best selling Children’s DVD of the year, is now on sale. It’s rare for a DVD go on sale, especially if the DVD is still selling well. But Mitzvah Boulevard is no ordinary DVD, and this is no ordinary sale. For the next 4 days, Mitzvah Boulevard will be on sale exclusively at MostlyMusic.com for only $17.99. Mitzvah Boulevard Co-Creators, Chaim Hershkowitz and Yankee Teitelbaum put two years of hard work into the DVD with one goal in mind: to enable hundreds of Jewish boys and girls to learn their Aleph Bais in a fun and memorable way. By all accounts, they have succeeded. In just five months, Mitzvah Boulevard has out-sold other Jewish DVDs, and, along the way, forced producers to drop their prices to compete with it. More importantly, Mitzvah Boulevard has been an educational milestone proclaims Chaim Hershkowitz. “The best compliment I get is when parents say that their kid knows all the Aleph Beis by heart and they’re ONLY two!” The response has been so overwhelming that Chaim and Yankee have been working on a follow-up. In the meantime, they plan to keep making Mitzvah Boulevard available so that thousands more children can learn from it. To order Mitzvah Boulevard, visit MostlyMusic.com. Below you can watch the Z Report interview with some of the cast from Mitzvah Blvd.